Stove Ranger Reviews - Too Good to be True? Stove Ranger is a residential system that you install over your stove top, buried within the hood, so that you can protect yourself against fires. When it senses a fire, it will release an agent to quell that fire and prevent it from re-igniting until you can call a fire department and get help. This preemptive protection can save lives, and save money. No longer will cooking fires be a risk in your home, one that threatens the safety of your loved ones. The cost of Stove Ranger is $99.99 plus $30.00 shipping, for a total price of $129.99. The design for the Stove Ranger is patented. The Stove Ranger is an innovative fire suppression that you can use for all cook tops or electric stoves. With this product you can reduce property damage and potentially reduce your insurance rates. With this unit you can save lives and even prevent injury. This unit is easy to install and will fit on most range tops without any tools. Everyone gets distracted while cooking at least once. Unattended grease or oil in a pan can take as little as six minutes to ignite into a blaze. That said, the Stove Rangers. As such this unit has heat sensing technology which will automatically extinguish fires. More over, in the event that there is a fire, it will release an eco friendly dry chemical retardant. In the event of a strove or cook top fire, the patented heat sensitive activation mechanism will automatically trigger and release the non-toxic, siliconized mixture of sodium bicarbonate in a cloud. Such a cloud is meant to cover the range top and extinguish the blaze, and in so doing minimizes the risk of re-ignition until proper fire services can be called. You can use it in houses, apartments, dorm rooms, and condos. Install it above most standard range hoods. This product is specifically meant for electric ranges only and cannot be used with gas fired ranges. The reason is, this unit is designed to suffocate flames on top of your stove. It extinguishes the flame, but if you have a gas burner, it fills the kitchen with gas and will make things much worse. You must read the instructions before you install as improper installation, changes to, or personal maintenance not in accordance with rules can cause harm. Users should void opening or refilling the disposable extinguisher units. Customers should also avoid disassembling their unit, immersing it in water, or immersing it in any other cleaning solution. Doing so will render it inoperable. This unit is only meant to help quell the fire when it starts, but you should absolutely call 9-1-1 and follow any standard safety procedures in the event of a fire in your home. 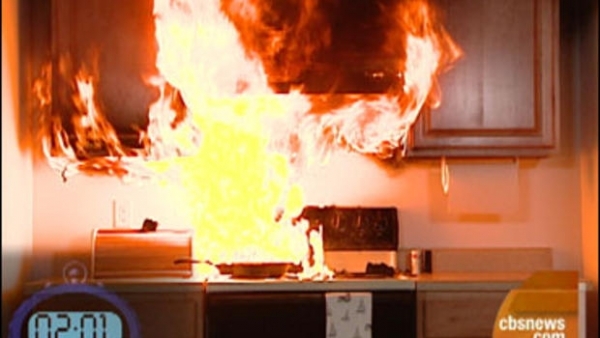 Cooking has been the main cause of home fires and injuries, even home fire deaths across the U. S. Nationally, fire departments respond to over 162,000 home fires that involve cooking equipment annually. These fires cause over four hundred deaths, over five thousand injuries, and over one billion dollars in property damage. Kitchen grease fires post a serious risk to everyone, especially with hectic lifestyles of today, but adults over 65 years of age are at the greatest risk of injury or death by fire. Those who have poor vision, poor hearing, or have health problems which impact mobility also put themselves at a higher risk for cooking fires. This product has a self-installation instruction video to help people install theirs step by step. Once it is installed, it will be confined to the range hood which means it is completely out of sight while also providing some protection. It is recommended that you replace the Stove Ranger units every five years, or immediately after it has been deployed. When it is time to replace the unit, the fire retardant needs to be dry and sealed within the extinguisher unit so once the seal is broken you cannot refill it yourself. You need to get a replacement instead. The fire retardant is a dry chemical and non-toxic. There will be no adverse effects if one is exposed to it, inhales it, or digests it. After it deploys, any excess fire retardant can be cleaned using a brush, broom, or even a vacuum Residual material can be removed with a clean cloth, warm water, and soap. Since this retardant is eco-friendly you can throw it away in the trash. The threat of a cooking fire has been dealt with for many years, so there are other comparable products on the market. Fire suppression systems are common for commercial kitchens. They can be seen in almost all of them. Taking note of these success stories, residential designs have been implemented in high end real estate development. However, the price point for these residential systems is quite high and beyond what most average households can pay. Stove Ranger was invented to be a new product that offered the same protection that high end homes and commercial properties get with an affordable rate. With this unit you get two extinguishers, a color coded measuring tape, different sized springs for different range hood depths, and self-adhesive mounting plates. Do not buy Stove Ranger online before searching Amazon. As the owners of Shutey Income Properties, llc, my wife and I have walked into more than one of our rentals to see that near catastrophic events in the kitchen happened without our knowing. We have placed Stove Rangers in all of our units to provide us with piece of mind knowing that our properties are protected even in our absence.